A staple of any summer wardrobe should be a simple shift style dress. Last summer we were in Alabama and everyone was wearing shift dresses. A lovely woman we met while dining on schnitzel under a giant rocket explained that everyone wears dresses because it’s the least amount of fabric touching your body. It’s resting on your shoulders but then just sort of skims the rest and hopefully you’ll get a bit of breeze and keep as cool as possible. I decided Girly needed a few shift dresses in her life. And the more “tropical” the print, the better! I love the center embellishment to break up the flat plane of the front. You can stay thrifty or you can find crazy expensive trim. The yellow flower trim was from one of the local big box stores for super cheap. I ironed on some fusible bonding web (stitch witchery) and then painstakingly poked each and every hole out between the flowers before ironing it to the front of the dress. Time-consuming but so worth it! 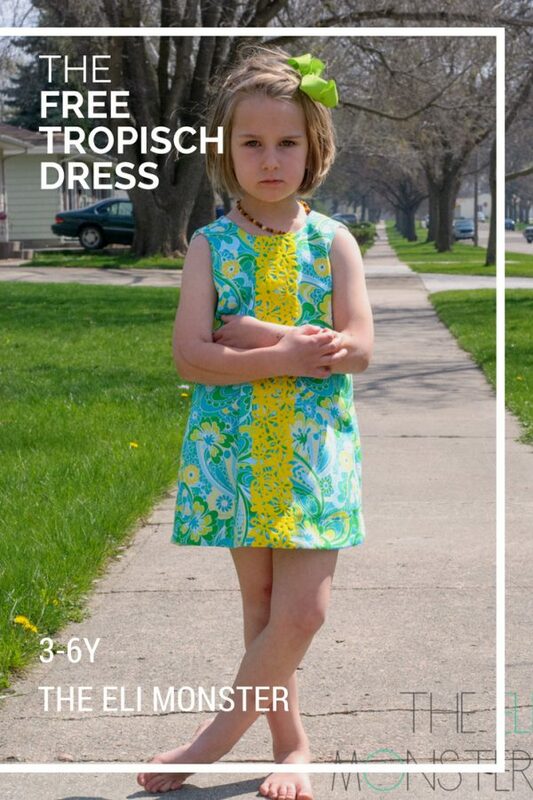 This free dress sewing pattern is only available in sizes 3-6 for now. I will draft more sizes in between other projects as I get time. The perfect pattern- so pretty.